Did Rav Moshe Feinstein read newspapers? 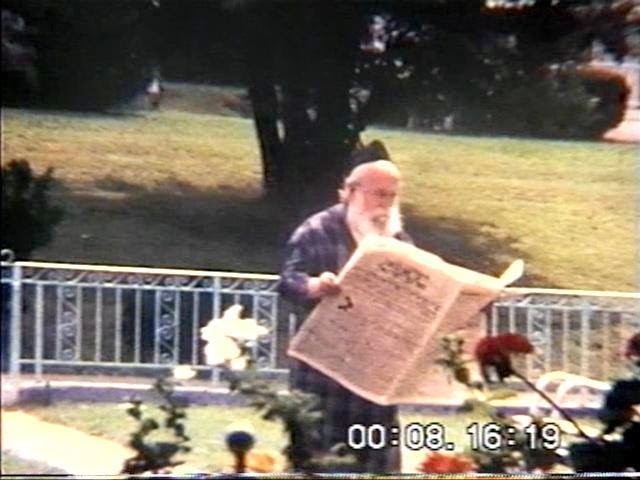 Rav Moshe Feinstein reading a newspaper. The Steipler once sent a shaliach to Rav Moshe Feinstein regarding an important issue which the Steipler wanted Rav Moshe to become involved in. The shaliach discussed the issue with R' Moshe and told him all the details. When he was finished, he pulled out a Hamodia newspaper, explaining that this newspaper happens to have an article about the inyan. Rav Moshe declined to take the newspaper, saying that he had already heard the details so there is no need for him to see the article. The shaliach persisted, explaining that it was possible that he missed one or two important details. Rav Moshe responded, "I have not held a newspaper in my hands for seventy years. As soon as I read a newspaper, I will no longer be qualified to pasken because my mind will not be one hundred percent Da'as Torah." This is an interesting story. It puts forth the idea that Gedolim have daas Torah, seemingly defined here as an oracular quality in which their pronouncements reflect the Divine Will, and that this daas Torah could be spoiled by paying attention to secular sources of information such as newspapers. We are perhaps meant to deduce that we should not read newspapers either, that we should respect Gedolim more than sources of secular knowledge, and should be impressed with deliberate ignorance of the world, because that is more likely to lead to an accurate, Torah-sourced, answer. The idea is that secular influences are a pernicious, corrupting force, and one should avoid it at all costs. It is strange that the shaliach could discuss the details with Rav Moshe orally, and this didn't spoil Rav Moshe's daas Torah. Even though the shaliach had read HaModia. Or that, had the shaliach written down the details in the newspaper, then reading those same details from the shaliach but in newsprint would have spoiled Rav Moshe's daas Torah, such that he would not be qualified to pasken. My shver was uniquely sensitive to society. Despite what they write in all the books about him, my shver never failed to read the Yiddish newspaper – either the Tog in the early years or the Morgn-Zhurnal later on – cover-to-cover every single day. People publish that he would walk down the street and avert his eyes when he passed by newspaper stands. There are a thousand talmidim of his who will testify, “I bought the paper and handed it to him in the lunchroom in the yeshivah,” but it does not make a difference for some people – they do not want to hear that. Even when he was not well and the doctor insisted that he must lie down to sleep for an hour, he would go home, put on a bathrobe, and smuggle a newspaper into the bedroom so that his wife would not see it. He sat there reading the whole time, rather than sleeping. I used to ask him, “Why do you read this chazeray (junk)?” He would respond to me, “Dos iz mayn vinde” – this is my window [to the world]. He understood society and his piskei Halachah show that. He used to say, “People think that because I’m aware of society, I became a meikel (lenient decisor). What do they want me to do – paskn incorrectly? I’m not a meikel – I paskn the way it has to be. The Halachah takes into account societal factors.” This willingness to be exposed to society made his teshuvos more meaningful and more acceptable. Did it occur to you to confirm this? Cause i just confimed with Reb Moshes family that its false. This week's parsha is Chukas, and in the haftara (Shofetim 11) we read about Yiftach. The sense one gets of Yiftach is that he was not the most refined or educated of individuals. Of ignoble birth, he left home and gathered a band of idle men. Yet sometimes a situation calls not for the refined, and educated, but for the coarse and uneducated. Think to the present day, with abuse that was covered up or mismanaged by the Jewish leadership. It took a few Yiftachs to lead the charge and change Jewish society for the better. Yiftach was tapped in order to deal with the immediate threat, but they appointed him as chief on a more permanent basis. And as a Shofet, which means governor or war leader, rather than necessarily a legal / "halachic" judge, he was a good pick. The rest of the story is ambiguous. I am not sure if we are supposed to respect Yiftach's commitment to his vow, at the expense of his daughter. (Don't retroject our values onto the Biblical text!) Or what we are to think of the slaughtering of Ephraimites, who it does seem unjustifiably picked a fight with Gilead in the aftermath of the successful fight. Chazal did not think too highly of his halachic erudition, and criticized both Yiftach (lay leadership) and Pinchas (halachic leadership) for not seeking each other out and resolving the issue of Yiftach's daughter. Even if a Yiftach is necessary for a given issue, we might be wary of ceding greater control to uneducated and unrefined individuals, and turning away from our previous leadership. Rabbi Aharon Kahn: Should we have built the Bais Hamikdash sooner? Rabbi Avraham Gordimer: What Was Korach Thinking? Rabbi Yehuda Henkin: Punishment and Education: What Did Korach Take? Rabbi Ari Cutler: Meraglim- lets be heads in Egypt??? Rabbi Ephraim Z. Buchwald: Had I Only Known! שלח לך אנשיםמה כתיב למעלה מן העניין? ותדבר מרים ואהרן במשה (במ' יב א). ואחרי כן, שלח לך אנשים. זה שאמר הכתוב: לא ידעו ולא יבינו כי טח מראות עיניהם מהשכל לבותם (ישע' מד יח). מה ראה לומר אחר מעשה מרים שלח לך אנשים? אלא שהיה צפוי לפני הקדוש ברוך הוא, שיהיו באין ואומרין לשון הרע על הארץ. אמר הקדוש ברוך הוא: לא יהיה להם פתחון פה לומר, לא היינו יודעים עונש של לשון הרע מה הוא. לפיכך סמך הקדוש ברוך הוא העניין הזה לזה, כדי שידעו הכל עונשו של לשון הרע, שאם בקשו לומר לשון הרע, יהו מסתכלין מה נעשה במרים. אף על פי כן לא רצו ללמוד. לכך נאמר: לא ידעו ולא יבינו. לכך כתב הקדוש ברוך הוא שלוח המרגלים אחר מעשה מרים. הוי, לא ידעו ולא יבינו, כי טח מראות וגו'. 'And all of you approached me and you said 'Let us send men before us' ', and in this as well the question of the oylam applies, why did they not send them prior to this, if it was in their mind to send? But it appears that earlier, the Israelites thought that the scouts would slander Eretz Yisrael and did not with to send, for that reason. But after they saw Miriam punished because slander, such that certainly they would not lie in order to slander Eretz Yisrael, for the same thing would happen to all of them, both they and Miriam -- therefore they said just then, let us send scouts before us. And this is what Rashi explains, why the juxtaposition? And by this he meant, why did they wait until after the leprosy of Miriam. This is only to tell you that prior to this, they did not want to send, because they worried that it would come to slander. But now that they saw the destruction which would come to their souls, to see the harm to themselves, to any who would stand for falsehood and emptiness, so say things which they had not seen -- and not take mussar?! As a rhetorical question, for certainly they would do this, namely take mussar." End quote from Tiferes Yehonasan. I like the question of the oylam. It basically supplies its own obvious peshat-based answer for the juxtaposition, and then uses that to question the derasha. However, I am not convinced by this rereading of Rashi. It supplements with too many additional facts, which are not mentioned in Rashi's source, Midrash Tanchuma. Tanchuma has Hashem knowing beforehand that the spies would sin, but makes no mention of the background of the bnei Yisrael even suspecting this. Nor does Tanchuma mention any such expectation on the part of klal Yisrael that now the scouts would not sin. And in opposition to reading the closing words of Rashi as a rhetorical question, the text of Rashi's source, the Tanchuma itself speaks of, and indeed darshens a pasuk, about the fact that the scouts did not listen, which makes it likely that in Rashi's channeling of the midrash, he also meant it as a straightforward statement. I think the answer is more straightforward (but not necessarily as satisfying as a reread). This statement is meant to be homiletic. Yet, there are peshat reasons for the juxtaposition as well. But this is part of a genre of midrash which looks at juxtapositions and speaks to motivations and emotions of various actors. So, for instance, this is an opportunity to make a statement of the kind made by the juxtaposition of nazir and sotah -- he saw the dire effects of drunkenness and so swore off wine. And Aharon got the service of the menorah in Behaalotecha because of jealousy of the korbanot of the nesiim. And it is sparked at least in part by the sidra divisions as well. That it starts a sidra also is a likely factor in Rashi's decision to repeat the midrash here, rather than omitting it. Was Calev ben Yefuneh the same person as Calev ben Chetzron? "Calev ben Yefuneh: He is Calev ben Chetzron, and his name is called Yefuneh because he [Calev] turned [פנה] from the counsel of the scouts." 'The son of Hezron'? He was the son of Jephunneh!42 — [It means] that he was a son who turned [panah] from the counsel of the spies. Still, he was the son of Kenaz, as it is written: And Othniel the son of Kenaz, Caleb's younger brother, took it!43 — Raba said: He was the stepson of Kenaz. ט וּבְנֵי חֶצְרוֹן, אֲשֶׁר נוֹלַד-לוֹ--אֶת-יְרַחְמְאֵל וְאֶת-רָם, וְאֶת-כְּלוּבָי. 9 The sons also of Hezron, that were born unto him: Jerahmeel, and Ram, and Chelubai. יח וְכָלֵב בֶּן-חֶצְרוֹן, הוֹלִיד אֶת-עֲזוּבָה אִשָּׁה--וְאֶת-יְרִיעוֹת; וְאֵלֶּה בָנֶיהָ, יֵשֶׁר וְשׁוֹבָב וְאַרְדּוֹן. 18 And Caleb the son of Hezron begot children of Azubah his wife--and of Jerioth--and these were her sons: Jesher, and Shobab, and Ardon. יט וַתָּמָת, עֲזוּבָה; וַיִּקַּח-לוֹ כָלֵב אֶת-אֶפְרָת, וַתֵּלֶד לוֹ אֶת-חוּר. 19 And Azubah died, and Caleb took unto him Ephrath, who bore him Hur. I would have to guess that Celubai in pasuk 9 is the same as Calev in pasuk 18. But on the level of peshat, we need not say that this is the same Calev, even though both are from the tribe of Yehuda. One reason to think it might be the same person is that we might expect Scriptural attention in particular upon important people, and so why should we focus so much on a random Calev? The answer might well be the terminal person, Betzalel ben Uri ben Chur. However, if we want to say that Calev is identical, then maybe we can salvage this without making Yefuneh the same as Chetzron. Perhaps Celuvai is not the same as Calev, in which case we never see him born to Chetzron directly. So make him a descendant, with Yefuneh as his father. I am not convinced by this though. Some folks raise the objection that Calev ben Yefuneh could not be the same as this Calev ben Chetzron. Because they claim, in the "Kenizzite Hypothesis", that Calev ben Yefuneh, whom the Torah identifies as the one sent from the tribe of Yehuda, was actually a Kenizzite, one of the native Canaanite people, who somehow was absorbed into the tribe of Yehuda. יג וַיִּלְכְּדָהּ עָתְנִיאֵל בֶּן-קְנַז, אֲחִי כָלֵב הַקָּטֹן מִמֶּנּוּ; וַיִּתֶּן-לוֹ אֶת-עַכְסָה בִתּוֹ, לְאִשָּׁה. 13 And Othniel the son of Kenaz, Caleb's younger brother, took it; and he gave him Achsah his daughter to wife. Thus it need not be the name of his nation, and I rather doubt that it is. This still does not mean that Yefuneh == Chetzron, or that ben Yefuneh is an appellation for Calev rather than his ancestry.